Richlite is commonly found in commercial kitchens and has been used for cutting boards and other food preparation surfaces since the 1960's. Richlite is an extremely popular choice in the commercial food industry due to the surface's sanitary properties and extremely low maintenance requirements. It is made from resin-treated paper, which is then pressed and baked to create a solid and durable sheet. Our Richlite material is made with a blend of post-consumer waste recycled paper or FSC certified components. All non-recycled material used in manufacturing is made from fibers of the rapidly renewable eucalyptus tree. Richlite does not contain urea formaldehyde and Richlite products are GREEN GUARD certified for children and schools. 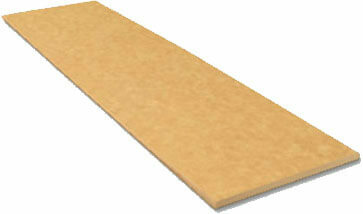 Richlite is an ideal material for cutting boards because of it's incredible durability. Due to it's high impact resistance, gouges, cracks, or grooves from your knives are uncommon. Richlite can also easily withstand most types of acidic foods. Why should you use Richlite? Richlite is the BEST cutting board material available! Withstands heat up to 350 degrees, so bring on the pots and pans!